In June 2000, Nike’s new supply-and-demand software planning system implementation from i2 Technologies had hiccups and led to losses of $400 million. 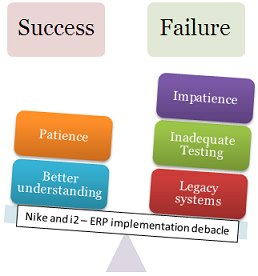 This case study highlights the failure and subsequent success of ERP implementation in Nike’s supply chain project. Playing the blame game. What went wrong? The problem – Nike’s new supply-and-demand software planning systems from i2 Technologies had hiccups in June 2000. The software incorrectly output orders for thousands more Air Garnett sneakers than the market had appetite for and called for thousands fewer Air Jordan’s than were needed. As a result, there were huge inventory problems and overdue deliveries.